The fabled Corvette is inching closer to production. Fans have been waiting anxiously for the arrival of the upcoming mid-engined Corvette. Spy photos as recently as January have shown the sports car covered up, cold-weather testing on snowy public roads with some of its C7 siblings – but these new shots may give us our clearest look yet at the new Corvette. 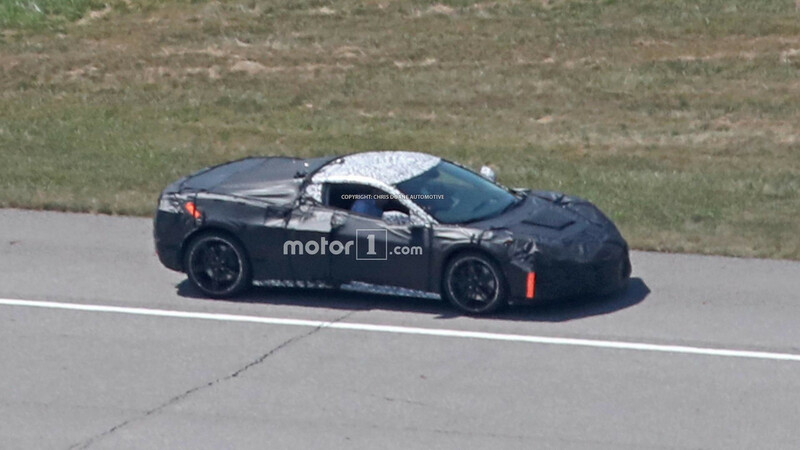 Caught in camouflage undergoing track testing at GM headquarters in Michigan, the C8 Corvette is pictured here wearing what our spy photographers believe to be production sheet metal. Similar to prototypes before it, the design features a sloping nose and an extended rear overhang, similar to other supercars before it (including a rival from across town). The new Corvette will reportedly be offered with three different powertrain options – two conventional gas engines and a hybrid offering. The three engines currently have the codenames LT2, LT6, and LT7, and power is expected to be somewhere in the neighborhood of 700 horsepower (521 kilowatts), at least 50 more than the current Z06. Three different roof options will also reportedly be available, including a standard fixed roof, a targa-style top, and a full glass option. The former of the three is seemingly pictured here… though engineers were quick to cover up the prototype once they noticed the camera. The mid-engined C8 Corvette is expected to make its debut at the 2018 Detroit Auto Show this January, and go on sale later in the year as a 2019 model. The current C7 and C8 will reportedly coexist for a number of years before the current model is discontinued, likely in 2021. Chevy will also introduce a C7-based ZR1 early in 2018, which we’ve seen testing on multiple occasions.